These missions are not war fighting, but the ships have enhanced capabilities for operating in seas far from home. They have gained experience in coordinating with other naval services on anti-piracy patrol, and exercised with other navies, including those of South Korea and Pakistan. In the summer of 2013 a Chinese naval flotilla passed through the Soyu Strait, which separates Hokkaido from the southern tip of Russia’s Kurile islands; they returned to their home base through the Miyako Channel. The People’s Daily trumpeted this maneuver as if it were a major triumph. Never mind that these narrow waters are international passageways or that they could easily be closed off if the Japanese decided to do so. China routinely conducts naval and air exercises beyond the First Island Chain as far away as the Philippine Sea, and the number of Chinese naval flotillas passing through the First Island Chain has increased significantly in recent years. There were two in 2008 and 2009, four in 2010, five in 2011, and eleven in 2012. In 2012 surface combatants were deployed seven times to the Philippine Sea; they were deployed nineteen times in 2013. The Maneuver-5 exercise in the Philippine Sea involved units from all three of China’s fleets, its largest open-ocean exercise to date. 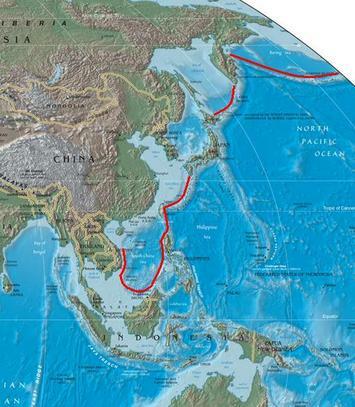 The Chinese navy has now penetrated all of the Western Pacific choke points along the chain, from the Tsuruga Strait separating Hokkaido from Honshu in northern Japan to the Bashi Strait separating Taiwan from the Philippines and the Sunda Strait in Indonesia. In October, 2012 a flotilla exited the East China Sea through the narrow passage way between Taiwan and Japan’s Yonaguna island in the Ryukyu chain (where the Japanese army has constructed a surveillance radar). This is thought to have been a signal from Beijing of displeasure over Tokyo’s decision to buy the Senkaku islands a month earlier. Later, two Sovremnny Class destroyers and two frigates exited the chain through the Miyako Strait and returned via the waters separating Yonaguna from Taiwan. The navy has steadily progressed from a handful of vessels, to multi-fleet (i.e. elements from all three of China’s fleets), to combined operations with submarines, drones and long-range bombers. Not only does China maintain a permanent anti-piracy force in the Indian Ocean, it now routinely conducts naval exercises and operates beyond the First Island Chain, says the US National Defense University. This year China was invited to participate in the Rimpac exercise in waters near Hawaii. It sent a destroyer, but also an intelligence-gathering ship, making it possibly the first time a nation spied on an exercise in which it was a participant. In June, 2015, Beijing issued a white paper on its defense priorities in which it stated what has been obvious to any naval planner paying attention: that China's naval interests are no longer limited to its coastline, but span the globe. “The traditional mentality [going back to Mao Zedong] that the land outweighs the seas must be abandoned,” the paper states. That the Chinese navy will enhance its capabilities for “open seas protection” just puts into words what is actually happening. The white paper leaves little doubt that China is intent on transforming itself into a modern maritime power, capable of challenging Japan or the US in Asia and elsewhere. Todd Crowell is the author of The Coming War, published by Amazon as a Kindle Single.